When it comes to buying right motorcycle clothing and essentials, there are endless options presented to you by the market. 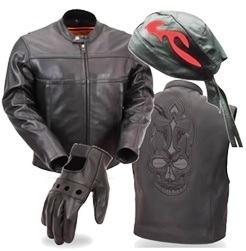 In terms of motorcycle clothing, there are variety of styles, designs and brands available online. All you need to do is just make sure that you opt for right safety gear for your riding trip. Also, it is important to take into account weather conditions that you may face along your journey. If it becomes cold, warm or wet, then appropriate gear should be there with you. For example: for wet weather, waterproof clothing is best as it gives you protection against rain. Therefore, it is advisable to choose quality ones, before you go on your trip. This will help you to be prepared for any type of adverse conditions. For amateur rider, having right type of safety gear is very essential. Further, even veteran riders do require safety gear as they can sometimes be in dangerous or deadly situations. Helmets – It is the most obvious and important safety equipment that every motorbike rider should have. Studies have revealed that riders who wear helmet are 37% more likely to survive a crash or accident than those who do not. Bike helmets are designed to protect head against shock or attenuated impacts to the skull of motorbike rider in case of fall. Riding Gloves – A good pair of quality gloves is very essential when you consider buying motorcycle safety gear and clothing. A good thing about this safety gear is that it keeps the rider’s hands warm. This safety gear reduces rider’s ability to react to any emergency situation. Keeping your hands warm and protected is very important if you are a bike rider. Tinted Goggles – To protect your eyes against harsh weather, you should opt for tinted goggles. It adds further safety by reducing glare and increasing visibility. This in turn gives the rider, an opportunity to observe dangerous or risky situations on the road. Further, this type of goggles protects eyes against bugs and flying dust/dirt at the time of riding a bike. Jacket – It is also important safety clothing for bike riders. How? It keeps a person warm and protected in case of a fall. Covering chest, arms, back and midsection, a jacket really can prevent lot of damage to your skin. Leather jackets are favourite of many bike riders owing to its quality and longevity. Some of the leather jackets come equipped with built-in body armour that provides extra protection in case of an accident or fall. Footwear – Leather boots are recommended at the time of riding a bike as it protects feet, lower parts, ankles and lower parts of leg. It provides utmost comfort and safety to the bike rider. When you purchase motorcycle boots, just make sure that they are made from thickest leather or other strong material. Thick material is less penetrable and also provides additional support to your legs. It is suggested that if possible purchase boots that completely cover your ankle. There are several coupon codes available online such as fc-moto coupon which allows you to make great savings on your purchase of motorcycle clothing online. Jenna Thrones is the owner of one of the leading motorbike clothing companies in UK. In her online store, She stocks wide array of motorcycle clothing and essentials to give the best protection to the rider.